Chop peppers and drain once more. Mix with the rest of the ingredients and refrigerate. Serve chilled on crackers or bread. This sounds like Pimento Cheese I bought at Heston’s Market in Little Rock, Arkansas. Best I’ve ever eaten. This recipe is very similar to how I make mine, so I know it’s delicious. 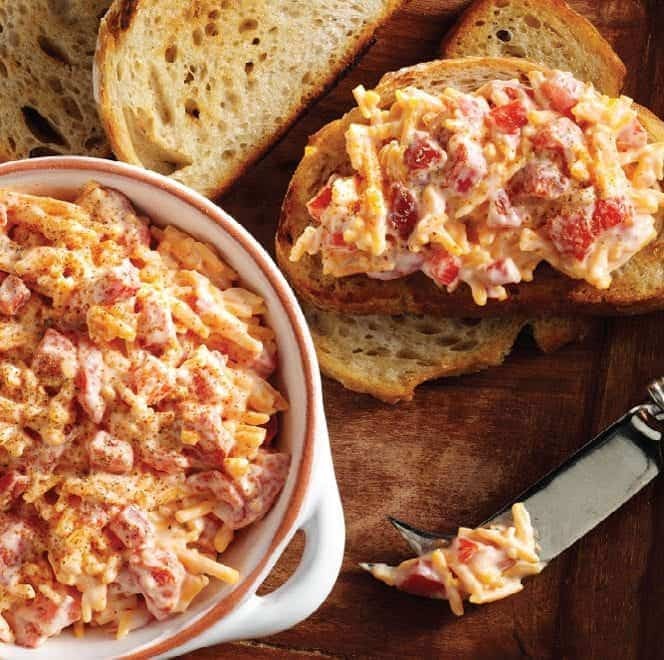 I accidentally bought roasted red peppers instead of pimientos the first time I made pimiento cheese, and I’ll never use anything else to make “pimiento” cheese! This recipe is missing a lot of information. It says to “rinse again” in the first step… we were supposed to know to rinse before step 1? How? Step 2 says “refrigerate”. For how long? Covered or uncovered? What size bowl would work best? One of the ingredients is just “salad dressing”. Which kind? Actual bottled dressing or the miracle whip type dressing? Cesar? Italian? Russian? French? Ranch? I personally feel this is a super lazy attempt at a recipe because it’s very vague. If its supposed to be left up to the person making it, why not say “Your favorite dressing” or something? Not just “salad dressing”and leaving us to wonder what the heck you mean. Thanks for your comments! We are about to review our current recipes (and hopefully add more) and your feedback on this one is helpful. For the record, we used Miracle Whip salad dressing, and we covered it while it was in the refrigerator. We’ll amend it!